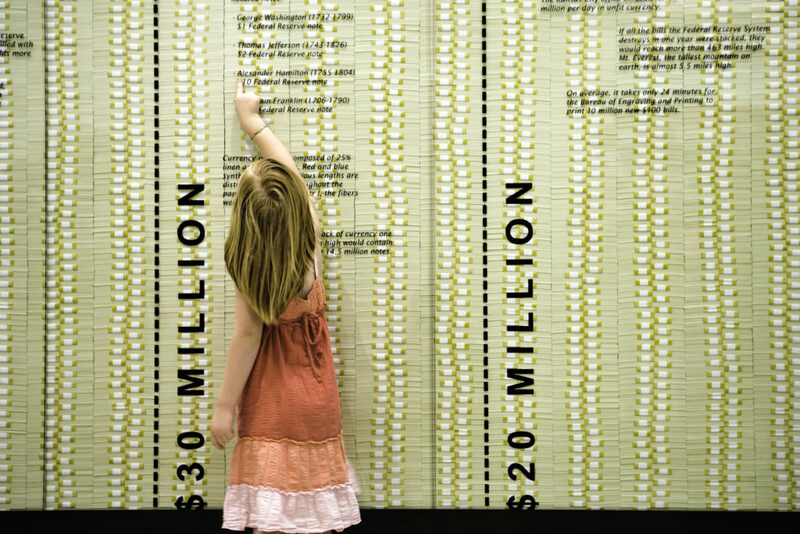 Teaching kids about currency is fun at the Money Museum, located inside the Federal Reserve Bank of Kansas City. Less than an hour away in Kansas City, Mo., you can see millions of dollars secured in one of the largest cash vaults in the region at The Money Museum in the Federal Reserve Bank of Kansas City. Imagine viewing a “wall” of 40 million greenbacks, stacked up in hundred dollar bills, just inches away from you. Less than an hour away in Kansas City, Mo., you can see millions of dollars secured in one of the largest cash vaults in the region at The Money Museum in the Federal Reserve Bank of Kansas City, 1 Memorial Drive. You can also watch human employees count, sort and bundle money, and automated forklifts and carts (named Huey, Dewey and Louie) moving all that moolah around. Get your exercise for the day by lifting a 27-pound gold bar worth about $400,000. Try to spot a counterfeit bill. Though it’s probably more than a day trip away, there are few places in this world that you can actually see coins being made, and the U.S. Mint in Denver is one of them. During your guided tour of the Mint, you’ll be shuttled into a series of glass-enclosed rooms overlooking the coin production floor, where millions of pennies are cut out, stamped and pressed right before your eyes. Watching all those coins shower from the presses is amazing. Remember watching “Mister Rogers’ Neighborhood” and being captivated by the factory tours? Well, you’ll basically be touring a factory where the product is money. You’ll be able to see where those coins in your pocket began their lives. Although gold bars are still stored at this facility, don’t expect any free samples. Check out some interesting artifacts, including a rare Thompson machine gun, once used by bank guards. And, just in case you’ve never had a $100,000 bill in your wallet, you can ogle one here. The museum is child-friendly, with lots of interactive exhibits. Kids will especially enjoy taking a stab at creating the nation’s next dollar bills. (They can even put their own photos on them.) Once they’ve come up with new designs, they can email their creations to themselves. 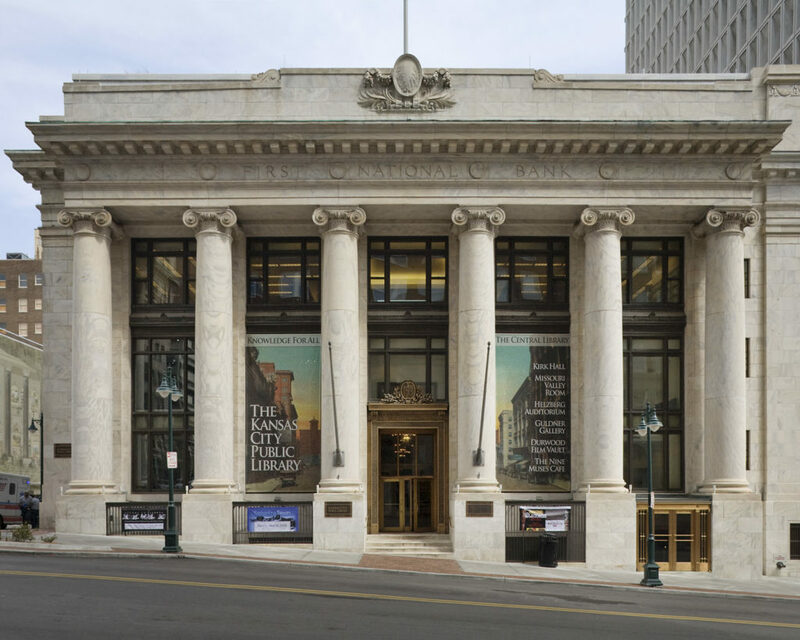 Although paper money and metal coins may dazzle, perhaps the greatest treasure to be found in our area resides in a 100-year old former bank building in downtown Kansas City that underwent a $50 million renovation in order to become the Central Branch of the Kansas City Public Library. Today the Central Library still houses the bank’s original check-writing desks, the gleaming chandeliers and marble floors in the historic lobby. The Grand Reading Room features a distinctive, 34-foot ceiling with a skylight. The old bank Vault (with walls of steel and reinforced concrete and a 35-ton steel door) is used as a movie theater. Any resident of Kansas or Missouri may obtain a library card and check out any of the 1,147,278 items in the Kansas City Public Library system’s holdings. Free movies are shown twice a week all year-round, prominent authors often give readings (I was able to meet Joyce Carol Oates when she visited a couple of years ago), there’s a giant chess set on the fifth-floor rooftop terrace, and the library café, Nine Muses, serves up delicious soups, sandwiches and chocolate-chip cookies.